This little bear pin is one of my greatest treasures from my childhood. He is really small – only about an inch tall. He was pinned onto the white top fuzzy part of my Christmas stocking. My sister had a similar pin on her stocking. I think it might have been a mouse, or perhaps a bear with a different fur color. I don’t know if she still has it or not. I loved waking up on Christmas morning to be greeted by this little bear on my stocking. He was my way of knowing that the stocking was mine and mine alone. We didn’t have names on our stockings, just this little pin to designate whose was whose. I still have the original stocking which is stored with our Christmas items, but I removed him to keep him inside the house so he doesn’t get destroyed in the Arizona heat. These two treasures were among my favorite things in High School. I went through a really strong pewter and crystal phase when I was hanging out with the wrong crowd of kids after school. 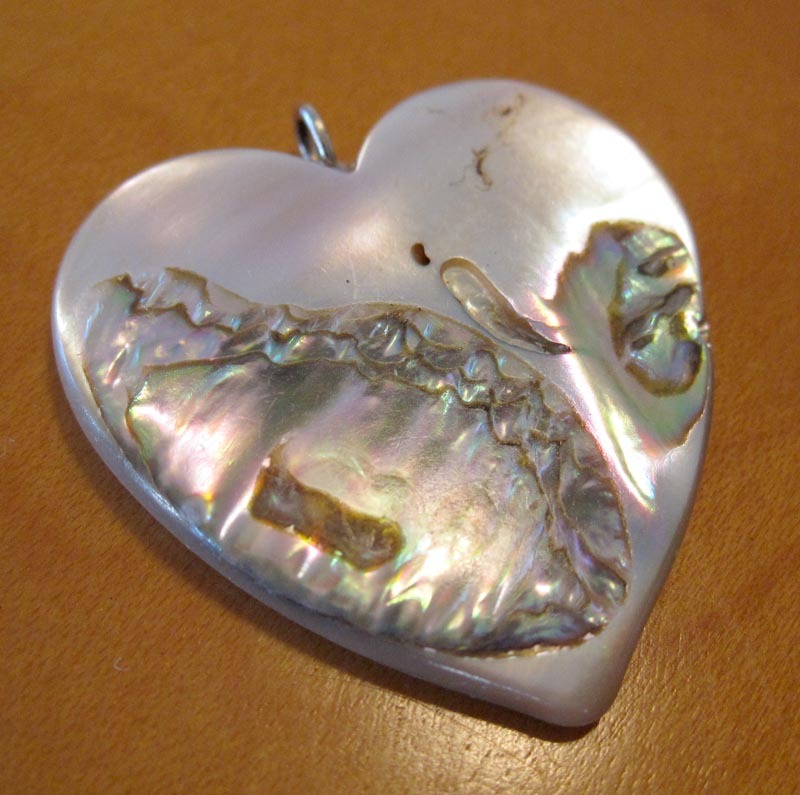 I wore one of these pendants every day during 10th grade and into 11th grade. These pendants saw a lot of sneaky youthful activities and dozens of mosh pits. Oh, the stories they could tell you! 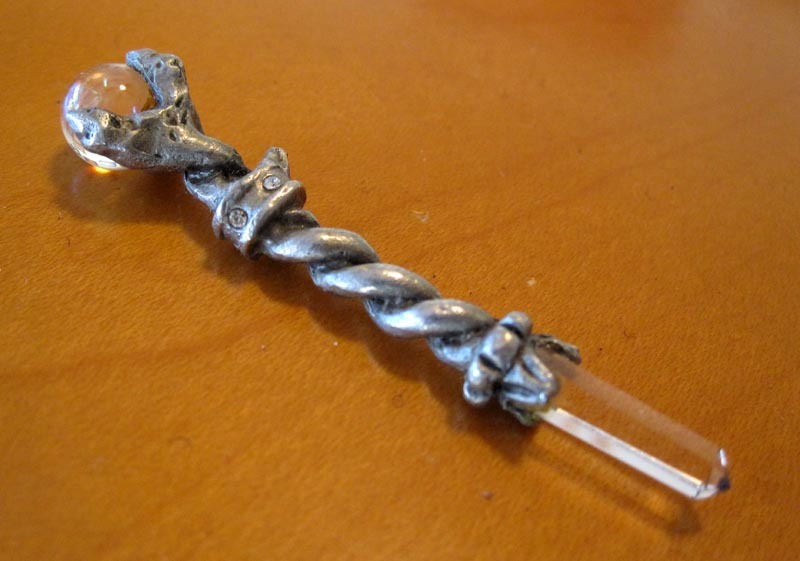 My favorite was the sceptre with the crystal ball for the top. Unfortunately, the reason I stopped wearing it was because the pewter piece that the chain hung around broke off because I wore it out. 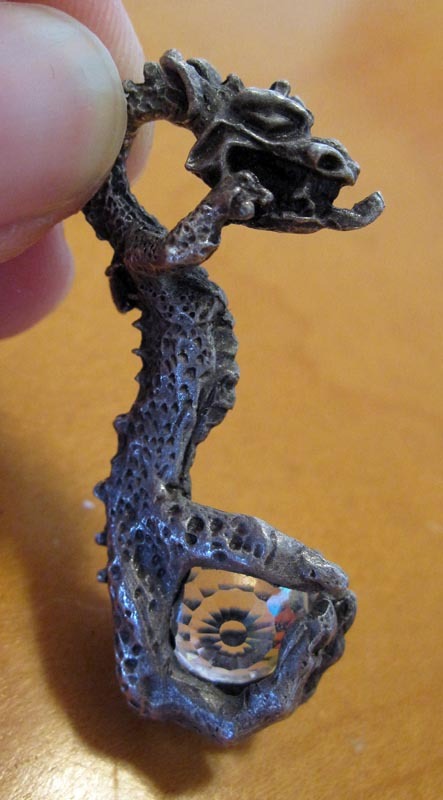 At that time, I picked up the dragon holding the crystal ball and wore it through the end of my rebellious phase. I absolutely love these pendants. They are two of my favorite treasures. For me, they symbolize my youth better than most of my treasures do. I purchased this opalescent pendant made from a rock at the mall when I was in High School. I was going through a rock loving phase and I liked how it shined in the light. There’s nothing much more to this. I wore it a few times but mostly I just liked to look at it. Simple as that! This week’s treasure is courtesy of my Aunt Helen Geneviere (Karpuk) Thompson. 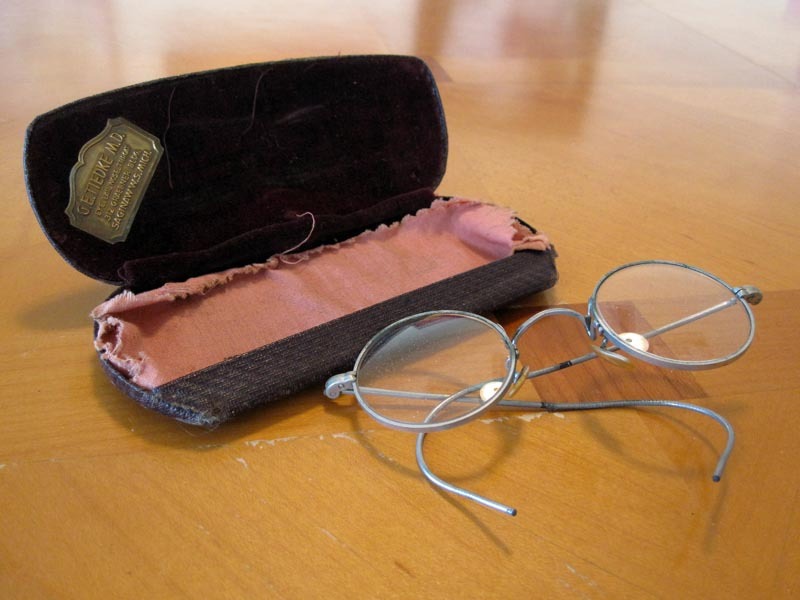 These were her childhood eyeglasses from the mid-1930s. They were given to my mother Diane when her sister Helen passed away in 1994 while the family was cleaning out her house. The pink cloth is also original to this case, and is stamped with the same doctor’s practice information. 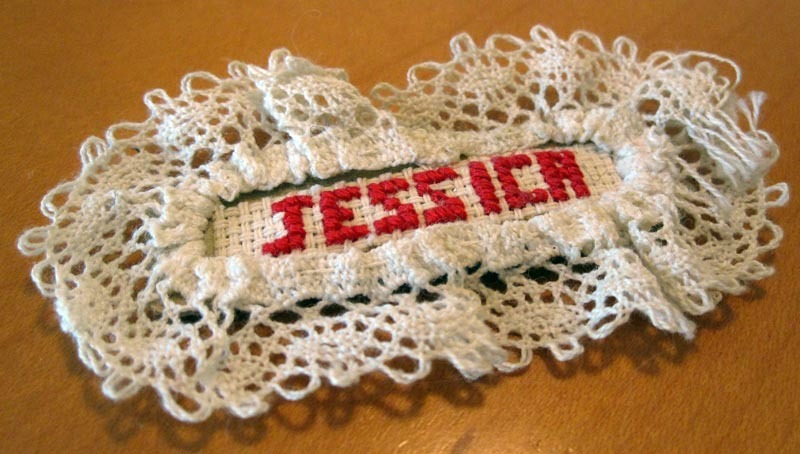 This family treasure is a little cross stitch with my name on it in red thread. My mother made this piece as part of a massive collection of cross stitch magnets and items she created and sold at our schools for extra income. She created the cross stitch names and cut them out. She then glued each name on a piece of cardboard cut to size, and glued a magnet on the back. Then she finished off the piece by gluing pre-made lace around the name. This magnet is about 2 1/2 inches wide. My mother made hundreds of these magnets and put them up for sale in the craft fairs. I remember standing at the school during the sale, looking at her display of names in all different colors and laces. I can’t recall how much she was selling them for, but it couldn’t have been more than $1 for each one. It was probably less than that. I treasure this magnet. It is rapidly falling apart due to age. The lace is yellowing and falling off the piece. The only thing that is not coming apart is the thread in the name, and the magnet is thankfully still securely attached on the back. 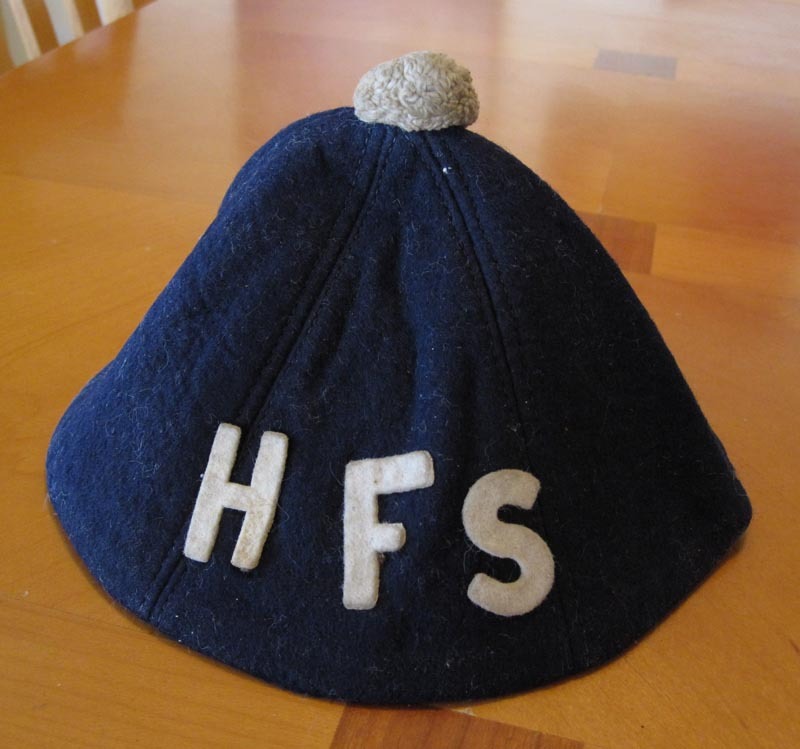 This little blue Beanie cap with the initials HFS was worn by my mother, Diane Marie Dreffs, in elementary school as part of her school uniform. She attended Holy Family School in Saginaw, Michigan in the mid and late 1950’s. She gave it to me in the year 2000 when I took an interest in the family history. It now resides in my closet, preserved safely for her grandchildren. 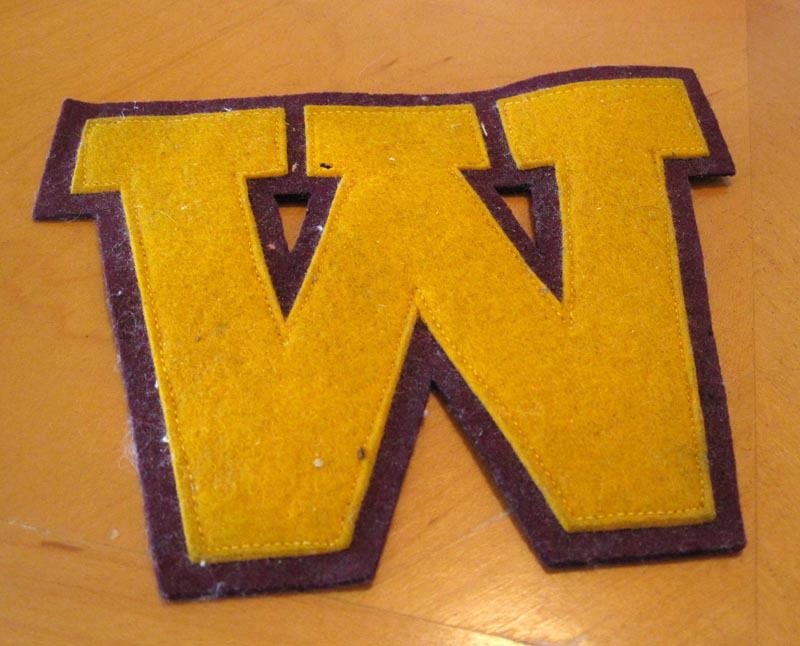 With it resides her school letter, a single W. This was worn when she attended Webber Junior High School in Saginaw, Michigan, in the early 1960’s. 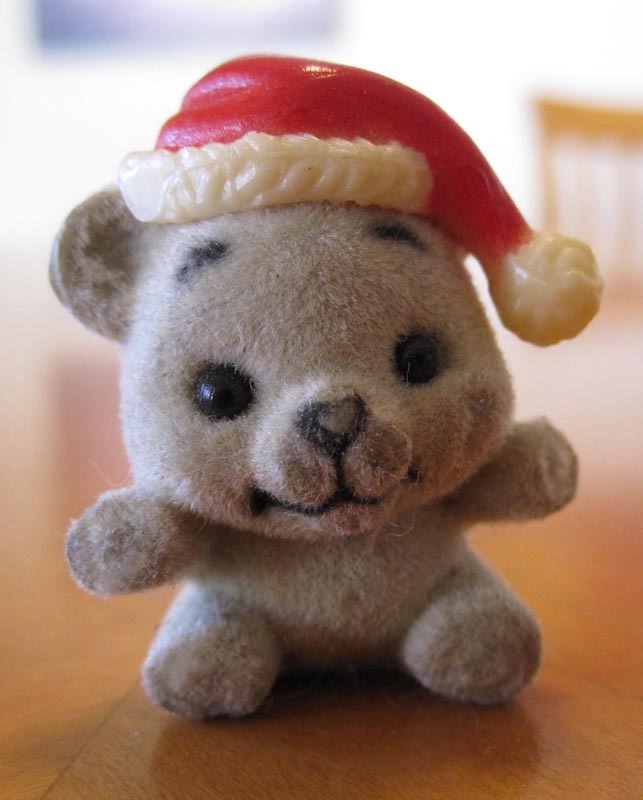 This little fellow was handmade by my mother, Diane Marie (Dreffs) Cole in the early 1980’s. Seven golf balls were hot glued together and the whole thing was spraypainted black in our back yard. She spread out newspaper over the picnic table and went to town with a spray can. She used a black puffball for a nose, a small piece of red felt for the tongue, two googly eyes and a pink doll hat. It’s hard to see in the picture, but there is a white goose feather in the hat. There’s also a black felt tail and two matching ears. 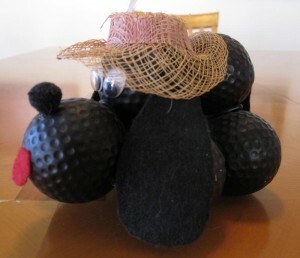 My mother made dozens of these goofy golf ball dogs and sold them at craft fairs at the high school. I’m not sure how I managed to salvage one. She must have gave this to me before she gave up the hobby. I love it! 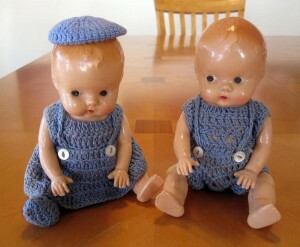 These little plastic dolls were once owned by my mother, Diane Marie Dreffs and her twin brother, Daniel Ray Dreffs. I’m guessing they would have entered the family in 1953 or 1954. As you can see, they have seen better days but are generally still in pretty good condition. The girl doll has one precious shoe remaining from her needlepoint outfit. The little beanie belongs to the set although I’m not entirely sure if it goes with the girl or the boy doll. My mother gave me these dolls in 2000 when I took up an interest in family history. They are a true family treasure. These little rings were some of my favorites when I was in Junior High and High School. I wore them often, which is especially evidenced by the middle ring from which most of the gold plating has worn off. They are all costume jewelery but I liked them very much. They now reside in a memory box in my closet. My 12th Birthday ring is special, however. This ring is real gold. It was not costume jewelery by any means. I received this ring on my 12th birthday from my DaD’s girlfriend at the time, Noreen Ackerman. I loved Noreen and this ring was very, very special to me. I wore it every day until I got my class ring in High School at age 16. 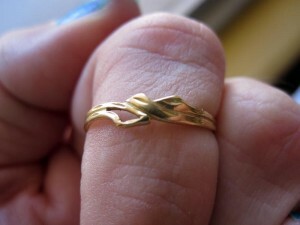 On June 20, 2011 I gave this little gold ring to my niece, Rachel, during her summer visit to Arizona. I told her that I received it on my 12th birthday and since she was now 12, it was her turn to have it. I hope she treasures it half as much as I have over the years. I took the picture to the left on the day I gave it to Rachel. 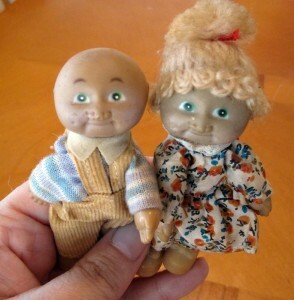 This week, my featured treasure is this rather large pair of Cabbage Patch Kid magnets. This little boy and girl used to reside on the refrigerator at my grandmother’s house. Mary Rose (Stroik, Kasper, Karpuk, Dreffs) Romaine used to let me play with them when my mother and I came over to visit. One day, probably sometime in 1981 or 1982, she let me have them. I have treasured them ever since. I was absolutely enthralled with Cabbage Patch Kids. My very own CPK was a boy with dark brown curly hair and a yellow jumpsuit. I officially had his name changed to George Michael. I even got a name change certificate in the mail. I don’t know what happened to George or his birth certificate. I’m sure he was thrown out or donated at some point when my DaD tired of me not cleaning my room as a child. Thankfully, these two magnets survived, probably because they were smaller and hidden away somewhere in the bedroom.